Decending Ortega Highway into the Lake Elsinor Valley, you will often see various birds. Dipping, gliding and soaring near the face of the mountain. Hang Gliders use these natural up drafts of air or thermals for fantastic flights over Lake Elsinore and the surrounding areas. The soaring forecast is provided by the National Weather Service in San Diego, CA. The forecast will not be updated if conditions change, other than at the normal issuance times of 6 AM and 6 PM. Call FSS at 1-800-992-7433 for detailed soaring briefings. Below is a 3D aerial photo created with Google Earth (part of Google Pack) which shows the launch location. 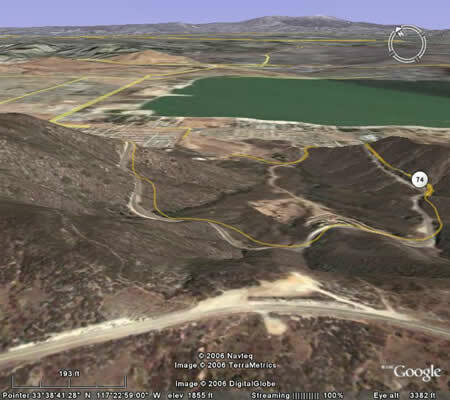 If you haven't tried it yet, download the Google Pack and install Google Earth to Hang Glide Lake Elsinore from the comfort of your own home.